Just over half of the more than 400 respondents to an informal Kotaku survey about the Xbox One say they will not accept an online requirement for single-player gaming. The other half said they would be able to live with it but offered wildly divergent replies as to how long they'd tolerate their single-player games working online on Microsoft's next console before having to connect to the Internet. Of that group, the most popular limit mentioned— given by nearly 60 people—was one month. They'd accept their single-player games running without an Internet connection on Xbox One for up to a month. These were the most popular replies to a question I posed to readers two Fridays ago in the hope of getting some clear statements about what gamers will or won’t tolerate in the next generation of gaming. Just 14 people out of about 400 said they’d be okay with being required to connect a single-player game within 24 hours of playing it. That was the duration suggested in our interview with Microsoft. The survey question was prompted by Microsoft’s acknowledgement last month that the Xbox One would require an online connection though not need one persistently. An Xbox executive had told us that the system might require an online check every 24 hours, though Microsoft has subsequently declined to re-state that and instead has now said that its policies are not finalized. Microsoft has offered a variety of reasons for the system requiring an online connection for any game, including the potential use of cloud-computing to make games run better. But the company has not presented the requirement as an option, allowing the inference that the online check is also a DRM or security measure. In the 10 days since I posted that, Kotaku readers have offered a wide array of answers. I’ve read through some 405 responses to that survey question and have counted at least 210 people responding with either “N/A” or otherwise saying they would not tolerate an online requirement for offline gaming. Some answers were vague and it's possible someone could have replied using two different user counts, so I can’t provide exact scientific numbers. I can say, though, that the tolerance for an offline mode split the responses just about perfectly in half. Of the nearly 200 people who said they would be able to live with some sort of online requirement for single-player gaming, about 60 people said they’d be okay if the system had to connect online once a month, just over 50 said they’d settle for a requirement of one week. A few dozen other respondents said they’d be ok with a variety of different day and week counts. Just 14 people said they’d be okay with being required to connect a single-player game within 24 hours of playing it. That was the duration suggested in our interview with Microsoft. A few said they’d be fine with an even tighter restriction on the Xbox One's offline gaming mode. One said they'd go with two hours, two said they'd go with one, one said five minutes, one said less than a minute. Five people said they simply didn’t care and would be fine with any online requirement. Taking it to the other extreme, some wanted the new Xbox to be able to be offline for a long, long time. Six said they’d tolerate a need to connect online once a year. One said they’d settle for once every 20 years, one for every 25 and one for every 9,861 days. “Will not accept this - don't want my entertainment put in the hands of anyone else other than my electric company.” - A reader who said they wouldn’t tolerate any online requirement. “I won't accept any online requirement. Period. Maybe it makes me a dinosaur, I don't care. I've stated numerous times how my middle class lifestyle has had Internet go out for various reasons and I expect several of those will happen again. If the benefit is faster load times or smoother frame rate, you can keep it. I want to play by myself BY MYSELF. That can't be difficult to understand. No ads, no notifications, no access. I want to play the game the way I want to and that only requires a TV, a console, a game and me.” - A reader who said they wouldn’t tolerate any online requirement. “This is hard for me, because I'm always connected. My system now is hardwired in. But considering I live in North Texas and the brush of bad weather we've had and the destruction in Oklahoma and in Granbury TX, the possibility of service going down is pretty high. I think the system shouldn't have a time limit. It should be able to just play the single player portion of a game without issue, especially if the game is bought used. Just taking natural disaster into consideration, many major services get disrupted. Survivors maybe able to go back home and have electricity, but cable/satellite service may still be down. You can't condemn a person from being unable to play a game because a hurricane or a tornado blew through town.” - A reader seemingly leaning toward not being ok with any online requirement. “Needs to be able to be offline completely. Lets face it. Some places in the U.S. still do not have Internet connection. 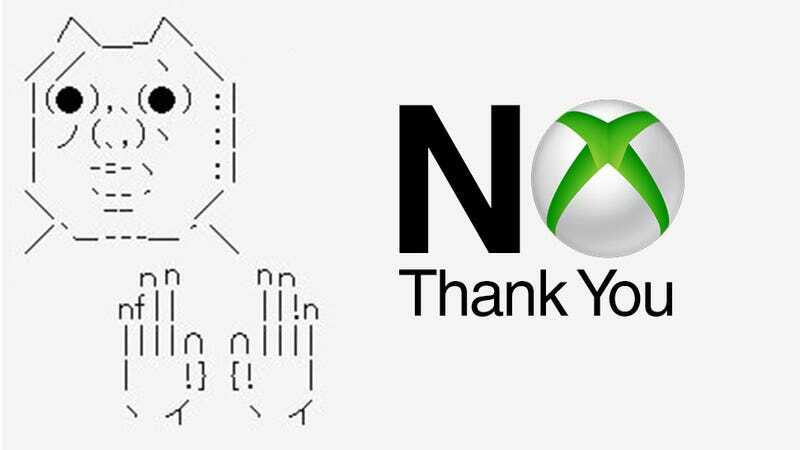 On top of that, what would happen if Microsoft decided to kill off the servers for Xbox One in 20 years? I still play my SNES, N64, Gameboy Color and so on....You'd be left with a 'Liquid Black' Paper Weight!” - A reader who said they wouldn’t tolerate any online requirement other than for an initial registration of a new game. “Seriously, it's not a big deal to connect once a day is it? You don't even need fast Internet for it. It's just a system check so you aren't stealing games. The slow Internet thing only becomes an issue when you have to download something. And you know games are going to have some kind of label that says ‘cloud connection required’ or something to that effect.”- A reader who said they’d be okay with an offline mode of one day. “I can see where Microsoft is going with the analogies of smartphones being always connected, but in sleep mode, etc. Wish it wasn't a requirement, but I can live with it.” - A reader who said they’d be okay with an offline mode of one day. “72 hours. I live in hurricane country and that was how long I was without internet after Isaac last year.” - A reader who said they’d be okay with a three-day limit. “I think once a week is acceptable. I think MOST people who would want to buy a next gen console will be able to connect at least once a in an entire week.” - A reader who said they’d be okay with an offline mode of one week. “I use Spotify and some other cloud-based services that require a login or some form of "call home" once every 30 days. I will accept that from the Xbox One. Once every 30 days is fine with me.” - A reader who said they’d be okay with an offline mode of one month. “If I have power (the lights are on), I'll have an Internet connection. I'd be content with an always-online system. I hope that an expectation that there will be an Internet connection available will allow game developers the freedom to come up with interesting new mechanics, like messages/invasions in Dark Souls or the companions in Dragon's Dogma.” - A reader who said they’d be okay with an always-online requirement. Several readers said they'd like to see the Xbox One's offline mode last as long as that of the PC gaming service Steam. But Steam's offline mode seems to last different lengths for different people, likely contingent on game publisher requirements. Gamers have reported that service's offline mode lasting for the game they were playing on it for everything from two weeks to many months (a spokseperson for Steam didn't reply to a request for clarification). So what’s it actually going to be? We will hopefully find out what Microsoft’s Xbox One online requirements for gaming are on June 10 when the company kicks off E3 week with a gaming-centric showcase of their next console. We’ll keep you posted.